When it comes to everyday clothes my main haberdashers are Wal Mart and Farm and Fleet. But for those special occasions calling for a classier set of duds, you just can't beat SoCal vato clothing superstore Greenspan's. 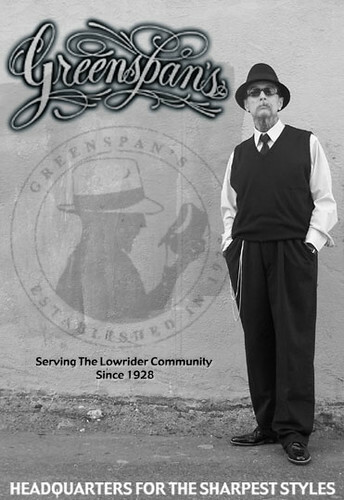 A Los Angeles institution since 1928, Greenspan's helped defined the lowrider look and was selling Zoot Suits to your abuelo before your papi was a gleam in his eye. They continue today with a full line of sharp styles from casual to Saturday quinceañera dressy. Go give 'em a visit and tell 'em Bolus sent you. The oldest joke in recorded history is from Socrates. 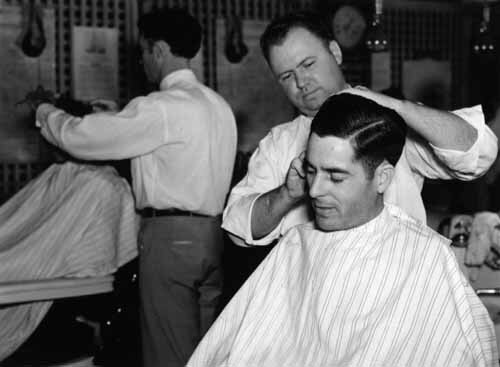 Sitting down in a barber's chair, he was asked "how would you like your hair cut?" To which he reportedly responded, "quietly." Guess you had to be there. Socrates may not have been much of a comedian, but, like us, he appreciated a good haircut experience. For me that means a barbershop that isn't part of a chain, doesn't have coupons, and where you can still whiff fumes of Wildroot Creme Oil while thumbing through a stack of old Field & Streams. They're still out there. My go-to place in Chicago is the Belmont Barbershop at 2328 W. Belmont. Top notch tonsorial staff, a pool table, and a fridge stocked with cold complimentary PBRs... and only 15 bucks for a cut (a steal in ChiTown). What's not to like? In my old stomping grounds of Austin, pal & Bolus contributor Ryan Cochran recommends the Avenue Barbershop at 1710 South Congress. Similarly old school, plus it hosts a regular Saturday "hot rods and haircuts" car show. When in Austin I also recommend Pete's Flat Top Shop at 6011 Burnet, where owner Pete Pernales is renowned as the Michelangelo of the Flat Top, and Wooten Barbers (Austin's oldest) at 2106 Guadalupe, next door to the UT campus. Up I-35 in Dallas, Rob's Chop Shop at 3613 Parry is another swell spot to get your ears lowered. Owner Rob Villareal really knows how to chop a mop, and has a killer Brian Bass lead sled to boot! Out west, I recommend Hawleywoods with two locations in Costa Mesa and Long Beach. Proprietor Donny Hawley is a maestro on the clippers, but please heed the strictly enforced dress code: leave your flip-flops, Oakleys, and fanny packs in the car. That's just a conversation starter. Got any recommendations in your vicinity? Leave 'em in the comments.